Some homes just aren't designed for family living – the hallways are too narrow, the bathroom cabinets too small, the kitchen counters are too cramped (and the list goes on). 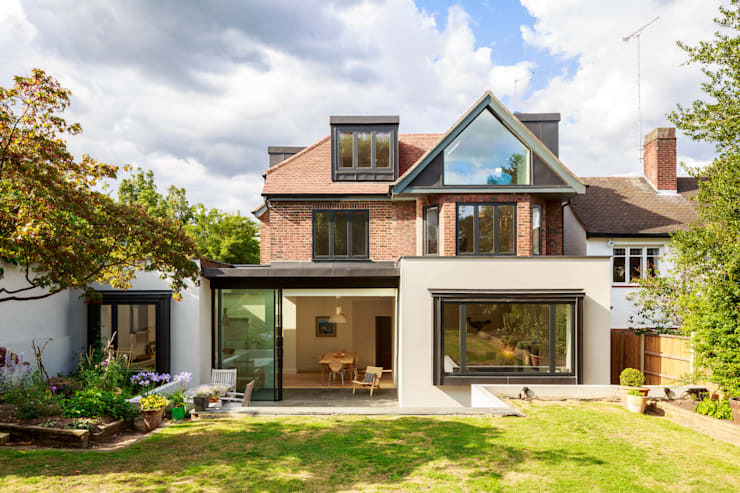 There's something to be said for this family home built by Jones Associates architects, which seems to accommodate a busy family lifestyle into every single room of the house. With practical designs for both chores and play incorporated into the design, as well as plenty of useful storage, this family friendly layout is one of the best you'll come across! Right away, the playful geometric design of the home's facade stands out as a stylish and modern element that brings a sense of contrast and movement to the home's appearance. An abundance of windows placed at various depths create a look that seems to jump forward and back in a high-energy layout. The generous spread of windows also contributes to a friendly and inviting look. This playful energy is matched by the bright green grass spreading in front of the home, offering a natural play area for the family. To the left, a garage opens up to let out some lawn furniture; it appears this family is ready to enjoy the sunshine with their picnic table setup in the corner of the yard! Unlike more compact dining room tables, this expansive wooden table offers room for family dinners, as well as sewing projects, homework, crafts, and other creative endeavors that require extra space for spreading out. It's rare to find a dining room table with so much workspace to offer! Adjacent to the living room, connecting to the garage, and close to the sliding door that opens to the yard, this kitchen enjoys an efficient location in the middle of it all. 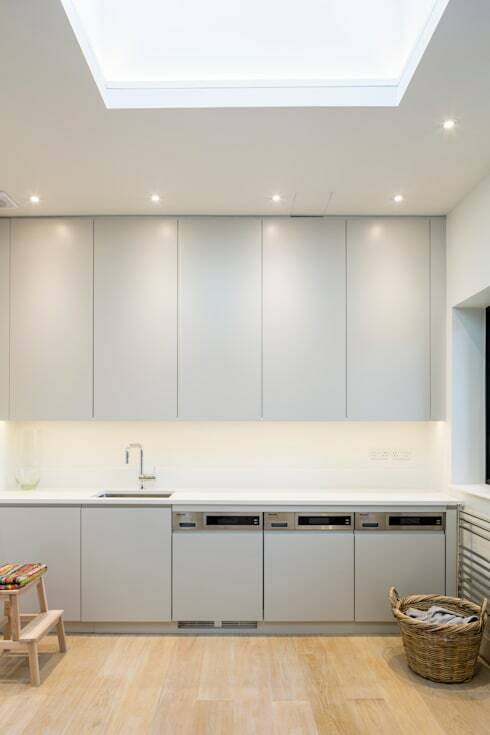 What's more, it employs smooth white cabinetry all around, which helps keep the space looking polished and clean. 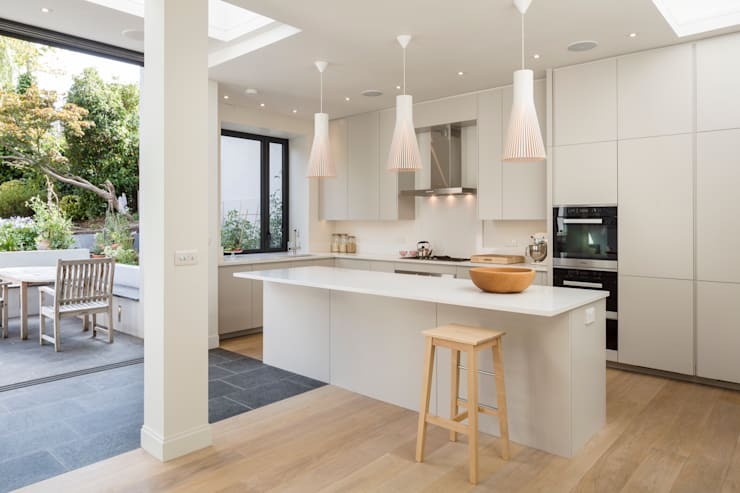 With a wide workspace available on the kitchen island and ample sunlight to illuminate the space, this kitchen offers a highly practical design for cooking up a storm. The friendly island not only adds countertop space, but it also creates a casual, friendly area for conversation while the cooking magic happens. Looking to upgrade your kitchen to create a more convenience space? Get some ideas in this ideabook filled with simple kitchen ideas that are easy to copy! Perhaps a parent's dream come true, this patio has been designed to include a small inner patio as well, as pictured in this view. Inside, the black tile floor of the patio continues for a few extra feet, where two white columns serve to visually mark the beginning of the indoor living space. Not only does this indoor patio provide an area for muddy shoes to come off before they hit the wood floor, this also creates an indoor-outdoor hybrid space where a parent can work, read, or rest inside while comfortably supervising kids at a distance. 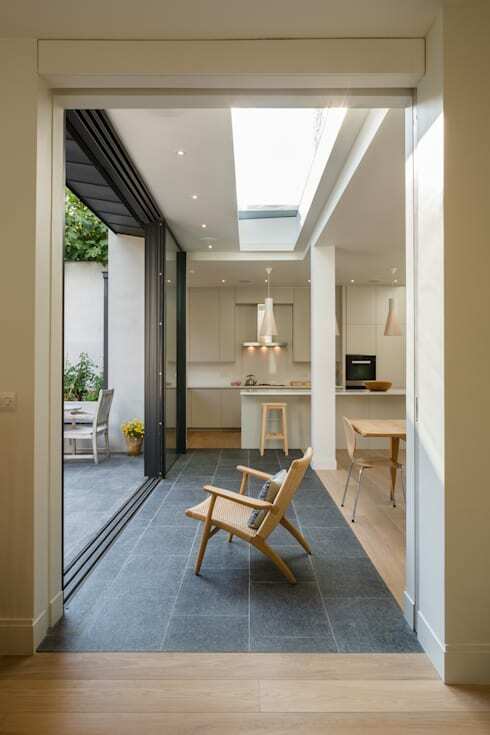 A long, rectangular skylight above serves to provide natural light in the space, opening up this indoor patio to the outdoors even more. Forget the child-safe locks – this bathroom comes pre-designed with mirrored cabinets that are up and out of the way of any curious toddlers. These mirrored cabinets also serve to widen the space with their reflection, as well as magnify the amount of light spreading through the room. 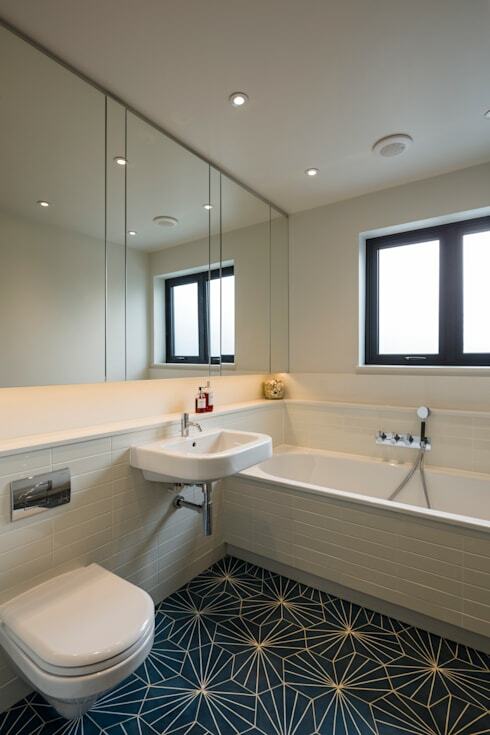 With tiles covering the lower half of the walls and entire floor, this bathroom is waterproofed against playful splashing, while a convenient shelf lines the entire perimeter of the space for accessible storage. 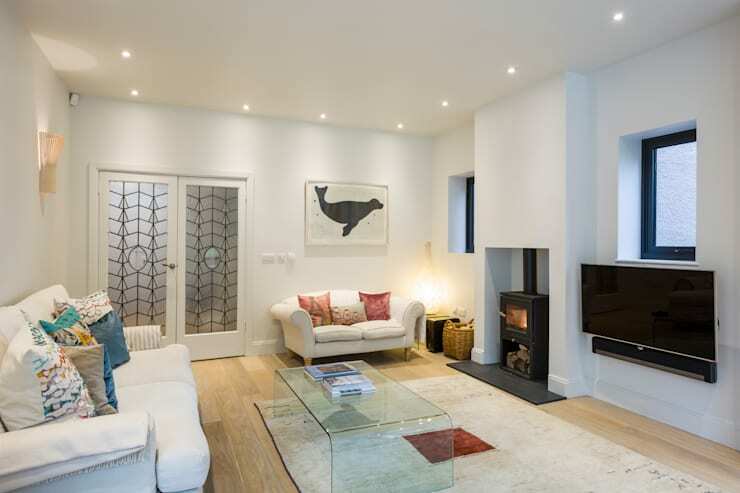 This wide room is ready for play, with a large floor plan to accommodate board games and toys, as well as a quiet sofa for reading a book by the wood-burning stove. Late at night, the translucent doors that mark the entryway of this room will provide a bit of peace and quiet for the parents as the kids head to bed. The joint features of a TV and a hearth provide various ways to enjoy this versatile playroom, from a fun movie night to a quiet fireside conversation. Barely recognizable as a laundry room, this brilliantly white space likely fits the description of many parents' laundry room of my dreams . With two separate washers to accompany the dryer, a generous array of cabinets, and a wide countertop for folding clothes, this practical laundry room is the icing on the cake in this convenient family home. For another tour of a well-designed home for large families, take a tour of this gorgeously grand family home! 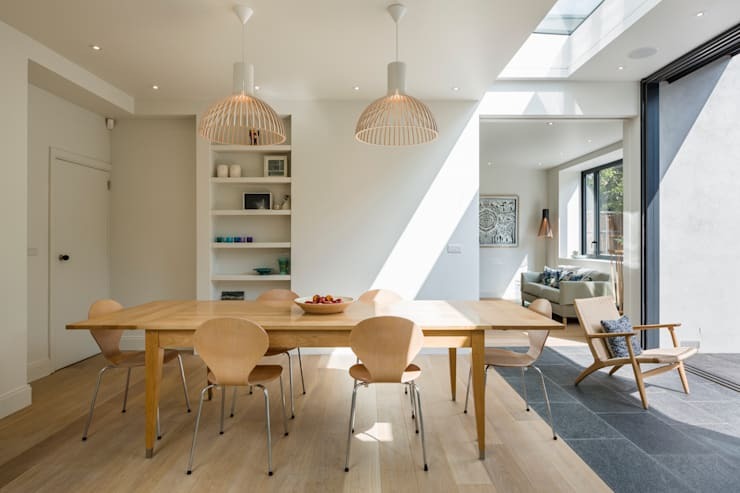 What do you think of this practical family home design? Share your insight below!